In her role as Lifestyle Management Coordinator, Jessica provides a broad range of insurance administration and household management services to JDJ clients. Jessica maintains household vendor schedules and maintenance calendars for client homes, working proactively to ensure the households run smoothly and issues are resolved promptly. 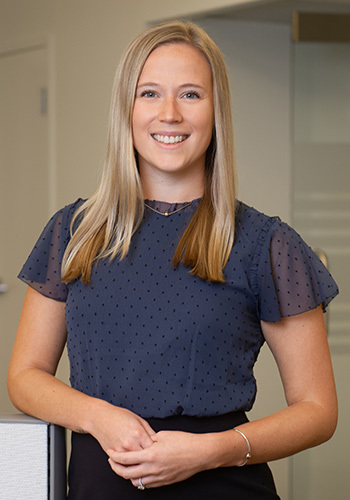 In addition, Jessica helps administer property and casualty insurance on behalf of JDJ clients, liaising with insurance agents to implement policy updates. Jessica also assists with domestic staff management, including formulating job descriptions, as well as payroll set up and administration. Jessica is enthusiastic, diligent, meticulous, and always ready to lend a hand with a client request or research project. Prior to joining JDJ, Jessica was a tour consultant at Education First, acting as the primary point of contact for up to 70 trips abroad per year, with an average of 20 students per trip. She guided customers through the entire process, from tour selection through final execution, coordinating the logistics and planning of each trip. In addition, Jessica was a customer relations manager at Morrill Insurance Agency. In this role, she reviewed and adjusted both commercial and personal line policies. She served as the point of contact for clients making changes to existing policies or purchasing new policies. Jessica also held the role of assistant program manager at Boston Sports Club, where she was responsible for marketing, planning, and producing sports programs that involved approximately 200 children at any given time. Jessica began her career as a community outreach assistant at WTTW Channel 11 in Chicago. She assisted in the preparation of events and promoted programs and sponsors through social media and direct marketing. Jessica earned a Bachelor of Arts in Communications: Media Studies, with a minor in Spanish, from North Park University in Chicago. Jessica is a licensed property and casualty insurance agent.